Our selection for this next round of Cook the Books Club is Scarlet Feather by Maeve Binchy, one of my all-time favorite authors, though sadly no longer with us. Acch!! No more new books. Having read all of them, mostly in order, I decided to start over, beginning with our current selection, as it promised more culinary potential, and which upon re-reading, seemed totally new to me. There was so much that I didn't remember, and most all great writers can be re-read with enjoyment, I'm sure. Binchy is an Irish novelist, short story writer, playwright, columnist, and public speaker, known for her sympathetic and frequently humorous portrayal of both Dublin and small-town life in Ireland, her unique and descriptive characters, her interest in human nature, and her often clever surprise endings. Her novels, which were translated into 37 languages, sold more than 40 million copies worldwide, and her death at age 73, announced by Vincent Browne on Irish television late on July 30th 2012, was mourned as the death of Ireland's best-loved and most recognizable writer. Scarlet Feather portrays a pair of ambitious young chefs, friends from cooking school, who are set on opening their own catering company in Dublin. 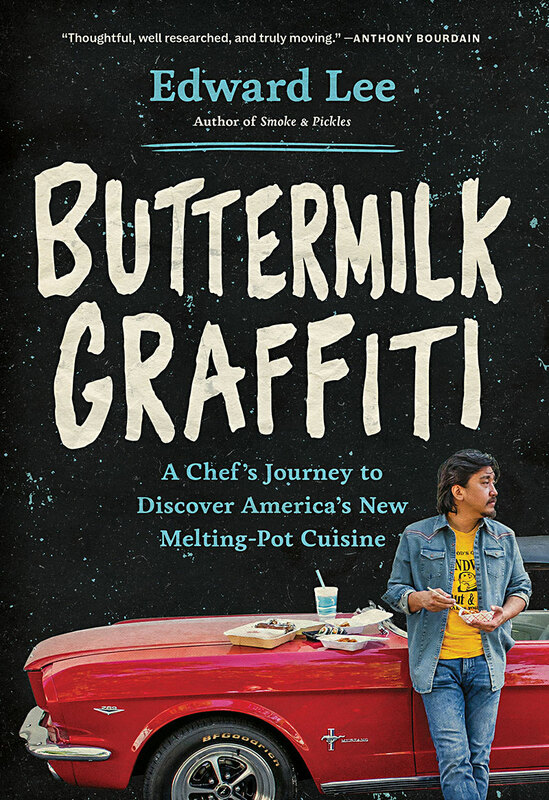 The book focuses more on the various relationships between Tom and Cathy, their significant others, family and friends; and how the main characters deal with extreme adversity, than on food in particular, though enough mentions are present throughout to give us all cooking inspiration. Apologies, for those who dislike longish books, but trust me, Binchy delivers a totally absorbing read. Just to encourage you, they are successful, and though tragedy strikes the culinary pair, they pull through, surviving, changing and growing along the way. 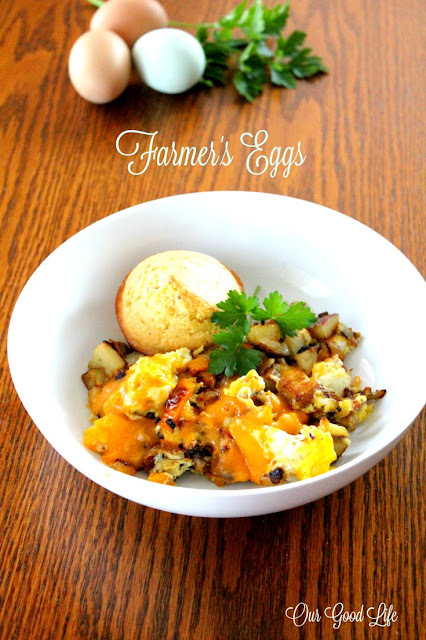 Amy of Amy's Cooking Adventures was our first entry for this round, saying, "This was a slow, meandering story, intertwining the food and stories from her family. It almost felt like going home for a family reunion! 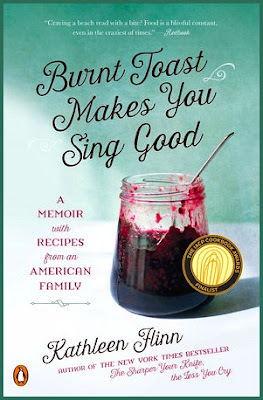 ...The memoir follows Kathleen Flinn’s family through several generations with stories, anecdotes and recipes. I loved this book! I also grew up in the Midwest (though a different part than the author), so I was able to relate to her and her history. Plus the recipes all sounded amazing and (again) many of them were foods I also grew up eating (with a few variations)." 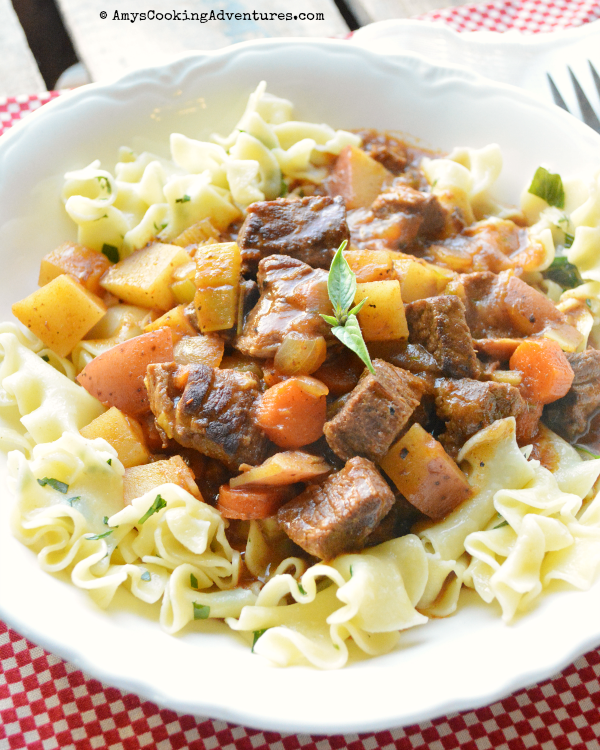 Amy found herself very intrigued by the Beef Stew Served With Egg Noodles from the book. Visit her post to see what she thought about the stew and the unusual noodle pairing! Wendy of A Day in the Life on the Farm was next and said, "This funny and poignant memoir takes place in my home state of Michigan during the same era in which I was raised so many of our memories are similar if not exact." 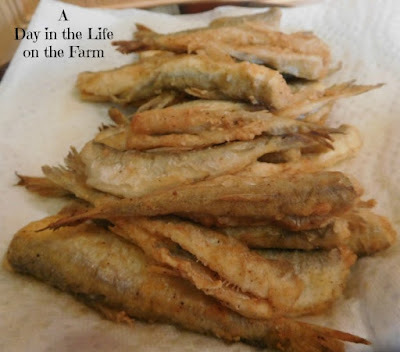 Wendy made Fried Smelt and remembered times in the kitchen with her mom, saying, "One of Kathleen's memories that I also shared was of smelt dipping. Each spring my Pops would go smelt fishing and bring home bucket loads of the tiny little fish. My Mom and I would pour them into the sink, grab her scissors and start cleaning. There isn't much to cleaning smelt, cut off their heads, snip across their belly and rinse. No removing scales, no cutting into fillets, no deboning...heck you don't even remove the tails. You simply dredge the entire thing in seasoned flour and fry them to a crisp. Soooooooooooo delicious and even more special this year because they remind me of spending time with a wonderful lady." Cathy of Delaware Girl Eats said, "I recognized many stories of Midwest life from my growing-up days. Even though the memoir takes place on a farm in Michigan rather than the suburbs of Northeast Ohio where I lived, the book by Kathleen Flinn perfectly catches the stories of that era of self-reliant life." Although she found the author's other books more evocative, Cathy enjoyed the many recipes like Midwest Beef & Beans Chili, saying, "I particularly liked her comment that chili, which I love, was exotic in her growing up era. 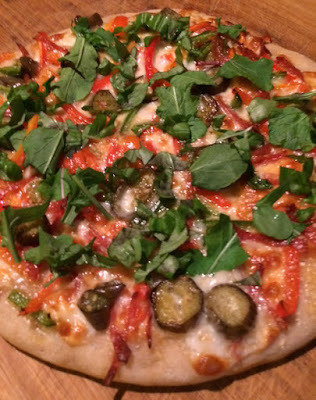 She highlights her grandfather Charles’ recipe included a quote from her four-year old brother Mike from that time saying in response to his grandfather’s question “Is it too spicy for you?”. To which he replied, “I like it. It tastes like firecrackers.” While the recipe needn’t be prepared so hot, it benefits from all the bean varieties that her grandpa included..."
CTB co-host Simona of briciole couldn't quite relate to Flinn's stories saying, "I can see how American readers may enjoy her stories and recipes. I grew up in Italy in a family that had nothing in common with Flinn's family. It was interesting to notice how much her experiences differed from mine." Simona did find inspiration for her Gluten-Free Seeded Crackers from the picture on the book's hardcover edition, “Below the title, there is a car with parents in front and five children in the back. Though our car was very different, it reminded me of my family car trips—mostly visits to family members or, in the summer, to the seaside, no camping trips. Sometimes my mother would carry a box of Ritz crackers in the car: both my brother and I loved them. Having very low carbohydrates as requirement for what I prepare these days made me scan various recipes for seed crackers. Using only seeds sounded fascinating: it works beautifully." 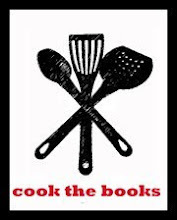 CTB co-host Debra of Eliot's Eats said, “Burnt toast makes you sing good,” is a saying that Flinn’s grandmother would use. It exemplifies the hardships of Flinn’s family and the practicality of a grandmother who didn’t waste anything. Flinn’s memoir is full of practical recipes (some that could be leveraged to feed an army) along with an honest telling of her family and her own formative years." 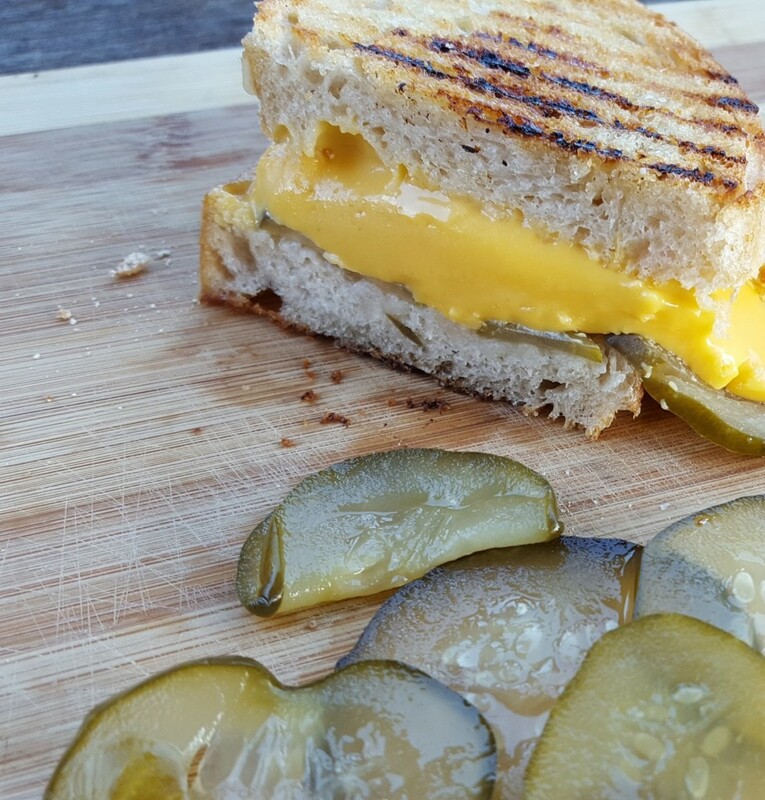 Debra found her inspiration in the Grilled Cheese with Bread and Butter Pickles, saying, "When Flinn mentioned the very strange combination (and family favorite) of grilled cheese with bread and butter pickles, she definitely had my attention. ... I’m not really presenting a recipe here, but let me tell you how good these sandwiches are. I used some good sourdough bread, rubbed the outside slices with olive oil, slapped on a slab of Velveeta (yes Velveeta), and sprinkled on a good quantity of bread and butter pickles. I totally recognize that Velveeta is a artery-clogging man-made cheese-like product and definitely not a superfood, but let me tell you that ooey-gooey warm cheese will make you nostalgic for comfort food of your youth." Finally, over at Kahakai Kitchen, Flinn has become one of my favorite food writers for her ability to no matter where the setting (Le Cordon Blue in Paris, teaching cooking classes in Seattle, or growing up in the Midwest), make me feel as though I am right in the story with her. Burnt Toast had me "feeling all the feels" while thinking of my own family and formative years. 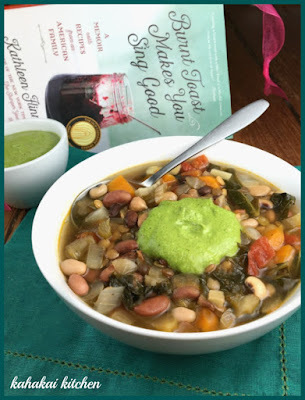 I made a vegan, slow cooker version of the "All-Afternoon Bean Soup"-- the first meal Flinn's mother made when the family moved from California to the farm in Michigan. I added mixed greens and fennel to the mix and to support frugality, I used carrot tops and fennel fronds to make pesto to top my soup. The soup had great flavor on its own and the pesto (was fabulous and) elevated the soup with its bright taste. Thanks to everyone who joined me for this CTB round. I enjoyed hearing what you thought of the book, some of your family memories, and the delicious dishes that it inspired! If you missed out on this round and like books, food, and foodie books, consider joining us for June/July when my fellow Hawaiian-Island dweller, Claudia of Honey from Rock will be hosting with the novel Scarlet Feather by Maeve Binchy. Hope you join us!